Sydney, Australia - February 26, 2014 - Altium Limited, a global leader in Smart System Design Automation, 3D PCB design (Altium Designer) and embedded software development (TASKING), announces the release of Altium Designer 14.2, the latest update of the DesignVision Award winning Altium Designer 14. While more and more Altium Designer users create large and complex boards, there is an ongoing focus on performance improvements. For this release, the emphasis of development was around the use of copper areas on the board. As a result of this effort, users can experience a significantly increased repour speed. Depending on the number and complexity of the polygon pours in a design, the repour speed increase can be anywhere from 2x to potentially greater than 20x faster. This is especially beneficial in later design stages by dramatically reducing the time to implement changes in the layout. Additionally, for users of DxDesigner from Mentor Graphics, the Altium development team have built an improved and updated DxDesigner file importer. The importer, currently in the later stages of beta testing, greatly helps designers considering the switch to Altium Designer. It is currently available on request from Altium sales and support. 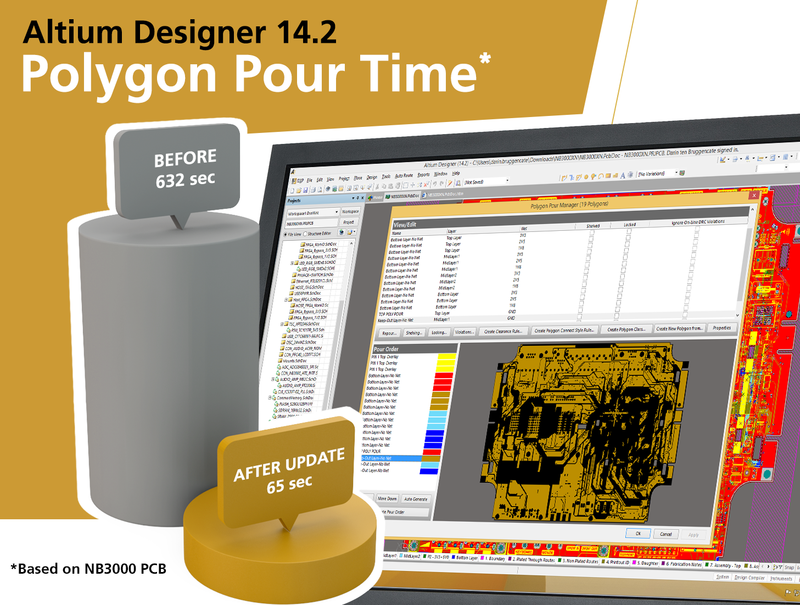 The Altium Designer 14.2 update is available to Altium subscription customers through Altium Designer 14 directly using the Extensions and Updates tool or the Installer can be downloaded from the Downloads page in AltiumLive.